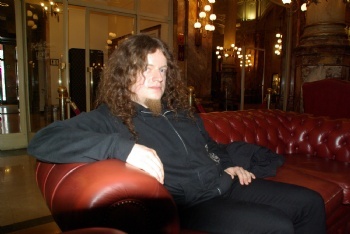 I was going to meet Opeth in a hotel lounge in Brussels. Unfortunately, Mikael had some dental problems and had to visit a dentist. So my interview was mainly with Fredrik, the new guitar player, who also had some interesting things to tell. Let’s talk about the new album, as it’s the only one you are playing on, so far. Why the title “Watershed”? Mikael came up with that title and regarding all the line-up changes in the band, it sort of means ‘a fresh start’. Often his titles were linked with a book he was reading or a record he was listening to. Not this time? Originally, he wanted to call the album “Repulsion”, but then he found the word ”Watershed” and he liked that and found it suitable for this record. No, it’s not. But the lyrics on this album are very personal to Mikael and he has decided not to discuss the lyrics with journalists. He won’t even print the lyrics in the booklet. They will be in it, but they will be coded. You will have to be a rocket scientist to decode them. But you can hear most of them on the album, so it’s not that difficult to discover them. Speaking about codes, I saw that there’s a code on the promo’s too, so they can be tracked if you put them on the Internet? Yes, I don’t know how it works, technically, but if you upload them, you can be traced. I wonder why people always want to put everything on the Internet. You’re not gaining any money with it. 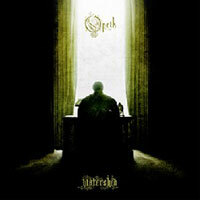 For example, the last Opeth record “Ghost Reveries” leaked on the Internet, although it was watermarked. A stupid thing to do, because it destroys your reputation as a journalist. The watermark is a better method for journalists than putting beeps or voice overs on every track. And it worked so far, because it hasn’t leaked yet and a lot of pre promo’s already went out for the interviews. Is the female singer on the first track “Coil” anyone I should know? The heavier parts are heavier, the quiet parts are more melodic, even the switches between the heavy and quiet parts are more emphasized? That was the goal of this record because Mikael was inspired by Scott Walker’s “The Drift”, which is very obscure and the sixties band The Zombies gave the psychedelic, experimental influences. I really like “Heir Apparent”, I like the contrast between the chorus and the verse. It demands something from the listener. It’s not easy to digest. And it leaves you with a longing to listen to the rest of the record. It’s a different sound, but still remains an Opeth sound. Yeah, it’s really important to maintain that. Every Opeth record has something new to offer and this one is in a good direction. It’s something new but still Opeth. And as you said, the heavy parts are faster and more brutal in some way. That’s your contribution? Because I can’t tell who’s playing which part on the guitar. Well, the thing is, the heavy main basic rhythm guitars are usually overdubbed by one guitar player. On this album, we did it more old school, Mikael and me rehearsed a lot and met up and played, so we were really tight together. So for this one, we recorded two each. It was good for me, being the new guitar player and getting that trust from Mikael. I play the fast solo in “Heir Apparent” and Mikael plays the slide solo in that one. I read on forums that the new Opeth is very heavy, but my opinion is that only a quarter is heavy, real heavy and three quarters is softer. In “Heir Apparent”, the growls are really very deep. Is Mikael really growling so much deeper, or are effects added to his song? On the first growls of that song, there are some effects added. I think he wanted to sound more brutal in his growls and he succeeded. I’ve always been impressed with his dark way of growling, similar to Dave Vincent from Morbid Angel. Is it healthy for a singer’s voice? There are no problems for him at all. He finds it horrid to do the clean vocals, in comparison to the growls. That’s something he can do anytime, he says. He doesn’t take any lessons. He must have some natural built-in technique for doing this. “The Lotus Eater” contains very complex rhythms. Even on the other tracks. Is that due to the new drummer? Absolutely. He’s an amazing drummer. Everything went very fast in the studio with him. He’s from a small town, Lynsköpping, in Sweden. He played in Witchery with Patrik Jensen from The Haunted and he has played with a death metal band called Nifelheim. I think he was recommended by Jensen and by Jens Bogren, our engineer and co-producer. How did you meet up with Mikael? It started five years ago, when Mikael saw me play in a pub in Stockholm. We were playing covers of Judas Priest and King Diamond songs. He came up to me and he like my playing. He was even asking me to give him some guitar lessons. I felt a bit embarrassed because such a great guitar player asked me to give him some lessons. So we were talking on and off during the last years. In 2006 we were on the same tour, when we were touring with Arch Enemy in America with the famous Gigant tour. 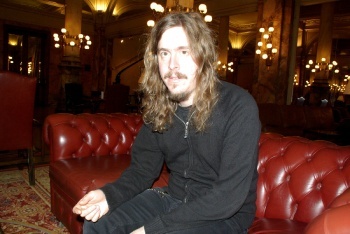 I hung out with Opeth a lot and I think we connected chemistry wise. Last year, in January, he invited me over to his house, to do a little jamming. I showed him some stuff. I understand now, that he was secretly auditioning me for the band. And you had to leave Arch Enemy, at that moment? Arch Enemy is from two brothers, from the beginning, Chris and Mikael. So Chris left the band and I got in. Suddenly Chris asked to come back and I was asked to leave Arch Enemy. So I got fired. We just finished all the touring. And you had Opeth, the day after? No, not immediately. I didn’t know what to do, whether is was going to form a whole new band. I got some small offers from other bands. But two months later, Mikael called me and said I was his first choice, which was very flattering. I was a big fan of Opeth, before. I used to go out and buy all his records. It was easy to say Yes. There’s a lot of different parts and themes in The Lotus Eater? There’s a lot of different stuff in there. It’s a track that demands a lot from the listener. It takes some time to adjust. Especially when it gets into that weird funky part with the keyboard rhythm. It’s an overdub of two keyboards? I understand it’s very difficult to play them both at the same time, rhythm wise. You have to split your brain. It’s something that Mikael came up with. He’s not an advanced keyboard player but he could show the top melody. What’s the conversation at the end of the track? It’s a mixture. Mikael is talking a bit and there was a violin player in the studio, who is doing a bit of the conversation and Mendez is talking Spanish. There are no secret messages, we just wanted to create the atmosphere of a mental institution. Were there any other guest musicians on the recordings? We also used a real church organ. The doom part of the last track “Hex Omega” is played in a real church, which created a lot of atmosphere. Does Mikael write all the music? Mikael writes the majority of the songs, but for this record Mikael and me wrote “Porcelain Heart” together. I came up with the intro and the doomy riff and Mikael liked it. He wrote the arrangement and pieced it all together. For the guitar solo’s, he called me up and I improvised some stuff. He’s a bit of a director for the solo’s. And then there’s “Burden”. Really seventies with a ‘John Lord’ Hammond solo and a “Gary Moore” blues solo. We wanted to make a seventies song, almost like a power ballad. I found the Hammond solo very amusing to listen to. The solo in the choruses is me playing and at the end is a trade off solo of me and Michael. Although I come from a metal world, Mikael told me to play a blues solo, a bit David Gilmour, Mark Knopfler. He wanted me to show a different side of my type of playing. Was the live album, “The Roundhouse Tapes” released to end an era or to fill up the gap between albums? It’s a perfect farewell for the old line up, but also the band, at that point, did many shows and it was tight and good. You signed with Roadrunner Records now? I can’t compare, but at least I can tell you that Roadrunner Records has everything well prepared and scheduled. And they don’t interfere with the creation of the music, because Mikael would be pissed off. 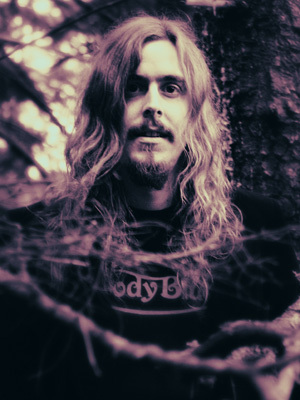 Which music do you listen to when you’re not playing with Opeth”? I listen to all kinds of metal, but I’m also a big fan of Rush, “2112” is my favourite. I liked their later stuff too. “Moving Pictures” was great and “Fly by Night”. And I listen to King Crimson and lots of other stuff. Did you meet Steven Wilson? Yeah, we played on this boat. (Mellotronen Festival) and that was the first time I met Steven Wilson. He seemed a very nice guy. Lasse Hoile, who shoots videos for Porcupine Tree, was there too and we actually did a video for “Porcelain Heart”. He understands our music. I haven’t seen the final result, but I saw a few snapshots. He’s using a new camera with a new technology called Red. It’s simulating the old 35 mm cameras. It looks really wide-angled, very atmospheric. When you’re touring, do you get to see the cities where you play or are you just travelling from hotel to hotel? People always think we see a lot, but that’s not true. We see a tour bus and the venue and the room where we change. Sometimes you’re lucky. I’ve been in Japan three times and I got to see some stuff. How does a band like Opeth end up on a Mellotron Festival on a boat? Actually, it’s not about the instrument but Mellotronen is a record store in Sweden where Mikael used to work. The owner is a friend of Mikael. I think it’s only a webstore. They have lots of progressive rock from the seventies and sixties. Mikael is involved in engaging the bands for this Melloboat festival. Opeth was the headliner and Katatonia was there too. 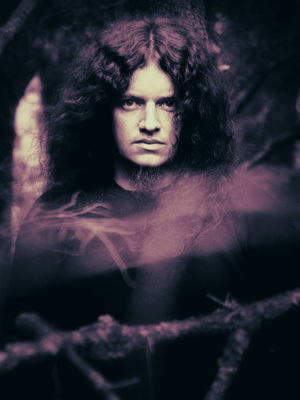 Mikael did a guest appearance with Katatonia for the track “Murderer”. And it was nice for me to get a chance to meet the Opeth fans. Now Mikael enters the lounge and I get five minutes with him. Hi Mikael, how are you feeling now? I just come from the dentist. It’s allright now. I’m fucked up with painkillers. I can’t ask anything about the lyrics? Well, you can ask the questions, but I won’t answer them. The lyrics will be encoded in the booklet. Who has the key? I don’t even have it. It’s Travis who did all the hard work. It can be decoded, but even if you do that, you will still be confused. I talked to Fredric about extremes being extremer on your new record. I always loved dynamics in everything, in films, in whatever. In our music, ever since the first album, it’s been one of the major ingredients. It’s basically what sets us apart from many other bands. And I guess this album was no exception. I tried to cover as much ground as possible with our music. Since we have so many influences, we used them and it’s inevitable you’re having a wide range of dynamics. What does Hessian Peel mean? Peel is like in orange peel but it can also mean like peeling skin. And Hessian is a heavy type of texture of cloth. It also comes from record collectors. The word is describing a very rough texture on album sleeves. How’s your project with Steven Wilson? We are going to do something but right now I’m very busy. And when I ask him, he’s always very busy. There’s no rush and it’s going to happen once. What albums are you listening to, nowadays? Fields of Rock with Opeth, amongs others, is cancelled. Aren’t organizers committing suicide with their high ticket prizes? I was kind of an oracle a few years ago. I was picturing this, when I said it would go this way with people downloading everything for free. Bands aren’t earning enough money from their sales and have to ask more for playing live. There’s a little bit of backwards talking at the beginning of “Hessian Peel”. What does it say? You just have to play it backwards, but it says “My Sweet Satan wandering in the courtyard.” It’s something from the top of my head that we did for the demo’s. That’s why I sang it, because that’s what they say they found on the Zeppelin song. “Oh My sweet Satan”. One last question. The title “Watershed”, is that linked to any book or album? No, not that I know of. But one of my favourite albums, has a song called Watershed. It’s on a solo album of Mark Hollis from Talk Talk. Okay, thanks for the interview and have a nice day off tomorrow.